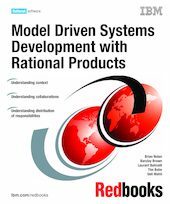 This IBM® Redbooks® publication describes the basic principles of the Rational® Unified Process® for Systems Engineering, which is IBM Rational’s instantiation of model-driven systems development (MDSD). MDSD consists of a set of transformations that progressively refine knowledge, requirements, and design of complex systems. MDSD begins with activities and artifacts meant to promote an understanding of the system's context. Requirements problems often arise from a lack of understanding of context, which, in MDSD, means understanding the interaction of the system with entities external to it (actors), understanding the services required of the system, and understanding what gets exchanged between the system and its actors. Managing context explicitly means being aware of the shifts in context as you go from one model or decomposition level to the next. MDSD suggests that a breadth-first collaboration based approach across multiple viewpoints is more effective than a traditional depth-first functional decomposition in creating an architecture that will not only meet requirements, but will prove to be more resilient in the face of inevitable change. MDSD also seeks to provide an effective distribution of responsibilities across resources. Joint realization and abstractions such as localities provide an effective and elegant way of accomplishing this. Finally, the ability to attach attributes and values to modeling entities and the parametric capabilities of SysML provide a basis for doing simulations or other models to meet cost, risk, and other concerns.